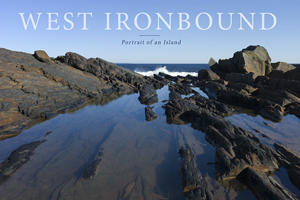 ​Published in 2011, this book joins other fundraising activities to assist the Kingsburg Coastal Conservancy (KCC), a local land trust and charitable organization in buying the second part of West Ironbound Island, a 120-acre island along the Atlantic coast of southern Nova Scotia. The publication is a collaboration of Mariëtte Roodenburg (photographs), Larry Gaudet (text) and Christine Higdon (design) and cost $29.95 (plus tax if applicable). It is published by Foggy Cove Books, P.O.Box 84, Riverport, Nova Scotia, B0J 2W0 Canada (ISBN 978-0-9877086-0-1) and can be ordered through this website.